I love when couple’s choose to get married and showcase their city! 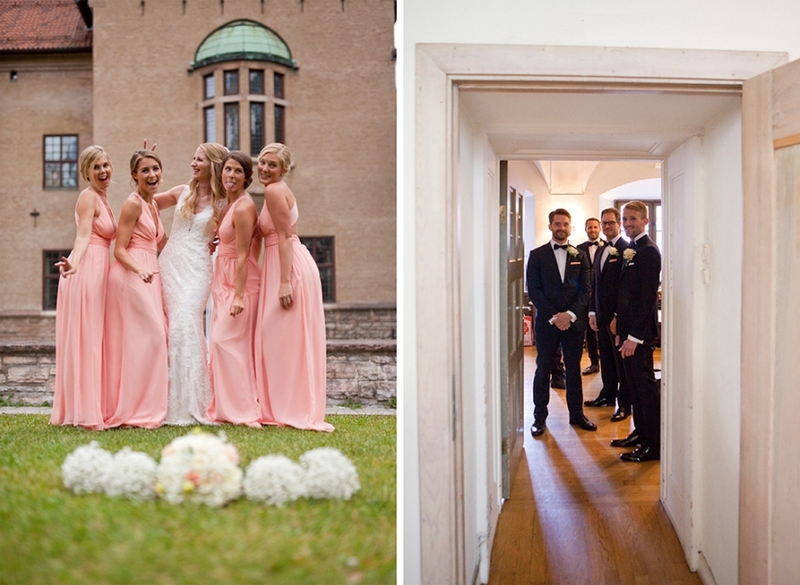 Natassja and Emil’s Stockholm City Wedding features some of the most beautiful places in the capital of Scandinavia including the beautiful Kungsholmen Church and Haga Park, which is where the current Crown Princess of Sweden resides. Natassja and Emil are the kind of people you instantly like. Although a tiny bit reserved at first, their warm spirits shine through and you end up finding yourself smiling along calmly with them. We started the day at the park on Kungsholmen that houses police HQ with Natassja and her Bridesmaids. These girls are so beautiful in their peach coloured dresses that I couldn’t resist contrasting the softness with the ruggedness of the trees in the park. We took a short walk up the hill to Kungsholms Kyrkan where Emil and his Groomsmen were waiting for Natassja and her girls to arrive. The anticipation in Emil’s body language says it all and they end up moving everyone, including their Priest when they finally say “I do” to each other. Natassja and Emil had arranged their Stockholm City Wedding in different stages and had planned to take a boat from Haga Park to their Reception where all their guests would already be waiting for them, having arrived by bus a couple of hours previously. So during this time, the three of us had some fun, and amazing light, during their portrait session. It was truly beautiful to witness Natassja and Emil’s Stockholm City Wedding and I am honoured to have been able to capture their big day for them. Check out a selection of images from their day below. It’s really wonderful that they chose to have a moment alone on their boat together while it took them to the Reception, too. I can only imagine the big cheer they got after they arrived.